I have failed so many times. Scripts that didn't sell. Readings that bombed. Pilots that weren't picked up. Jobs I didn't get. I definitely mope and feel awful about myself after these rejections, but I move on. I have heard about Maya Forbes' career for over a decade as the filmmaker and writer-friend who grew up in Cambridge, went to Shady Hill School, studied at Harvard and wrote for The Harvard Lampoon and then to LA to write for The Larry Sanders Show. I experienced her generosity first-hand, years ago, when she discussed writing with me for two hours, as we both juggled children (I hid out in my car parked in the driveway leaving mine to fend for themselves and I think one of hers was lying under her desk.) She also co-wrote the feminist-inspired script in Monsters vs. Aliens and wrote and produced a cult favorite called Seeing Other People. Her first directorial debut, Infinitely Polar Bear, is an autobiographical story of a bi-polar father and a working mother doing their best to raise a family. Mark Ruffalo who plays the lead role in the film, and revealed by Maya to make delicious veg-laden soups while filming, was nominated for Best Actor at the Golden Globes. Who doesn’t want to be part of that? The film came out on iTunes this month and is available on Blu-Ray and has been critically acclaimed with Zoe Saldana nominated for an NAACP Image Award for Outstanding Actress in a Motion Picture and the movie itself for an NAACP Image Award for Outstanding Independent Motion Picture. I sat down Cambridge-grown Maya Forbes to learn about what it takes to make it in Hollywood and how she continues to push the work that matters to her. Apocalyptic scenarios that are completely within the realm of possibility. What project are you most focused on today? My husband (Wally Wolodarsky) and I wrote a script called The Polka King for Jack Black. It is based on a real person, a man who emigrated from Poland and became the (self-proclaimed) King of Pennsylvania Polka, much the way Michael Jackson proclaimed himself the King of Pop. It is about the dark side of the American Dream – the way believing in yourself is a necessary component of making it big in America but it can also send you down a bad path. It is also a love story about a man who adores his wife and wants to make her happy. So, a comedy about a delusional couple trying to achieve the American dream. Wally and I are co-directing it this summer. You’re in an extremely competitive and difficult field in which to make a living, how did you keep the momentum up? You have to force yourself to sit down at your computer for a minimum of four hours a day and attempt to write. Sometimes you have momentum; sometimes it's a slog. Getting my first job at "The Larry Sanders Show." I loved writing for that show and it allowed me to do what I am best at, which is character-based comedy. The actors were incredible, a joy to write for. I learned a lot from Garry Shandling. Is it harder to get the words down, the talent booked or the project funded? The project funded. Getting the talent helps get the $$$ and I love actors so I enjoy getting the talent booked. Which one do you like most? I like getting the words down. Which one do you like least? It can be really hard to get the words down. My freshman year of college, I had a one-act play read at Playwright's Horizons as part of The Young Playwright's Festival. It was a drama, but it got a lot of laughs in the staged reading. I felt like I was on the right track. When did you fail and did you feel like giving up? I have failed so many times. Scripts that didn't sell. Readings that bombed. Pilots that weren't picked up. Jobs I didn't get. Jobs I got and then was fired from. I definitely mope and feel awful about myself after these rejections, but I move on. Experience (meaning: lots of failure) has taught me to move on. I never considered giving up because I love telling stories and wondering about people and inhabiting make-believe worlds. 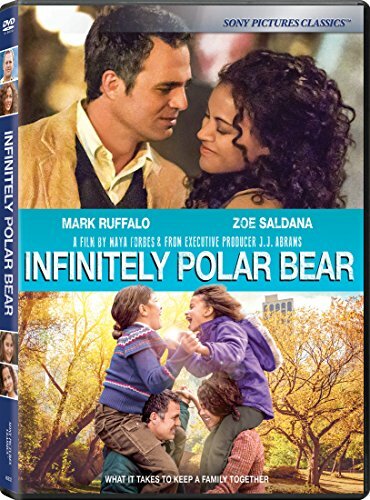 Why do you think Infinitely Polar Bear has struck such a chord with people? It told a real story about the real struggles of a family. The actors play it very authentically, with humor and sadness. I think of it as a celebration of family with all its ups and its many, many downs. There's a lot of love in the movie and I think people respond to that, because family is the place where love and pain are so intertwined. And it's funny. What’s it like to work with Mark Ruffalo? In addition to being an exceptional actor and wonderful person, Mark makes excellent soup. It was cold when we went into production and I was very grateful for his soup. He uses a lot of vegetables. I was truly lucky to work with Mark and also with Zoe Saldana on my first directorial effort because I had the benefit of all their experience and I could learn from them. They were very generous, and committed to helping me execute my vision. What’s it like to work with your husband? We get to talk about work all the time, which is how I like it. There is no set way. Sometimes we write together and sometimes we will split up scenes and then put them together and go through the whole thing as a team. I am looking forward to co-directing with him; he is very calm and he has great ideas and he comes up with great jokes in the moment. Do you have to push, as a woman, to be respected in Hollywood when you are both in the meeting? I have been disrespected at times but I think that happens to everyone. I did feel that I had to direct a movie on my own in order to legitimize myself as a director, but also to experience what it was to be the final word and have all that pressure. It was both exhilarating and terrifying. I loved it. What public opinion would you like to change? There are so many public opinions I'd like to change: Mostly as a means to changing public policy. I'd like to see more compassion and generosity expressed, and then enacted. Is there an east coast inner circle out in Hollywood? Does this help? There might be one, but I'm not in it! What do you love about LA? I love the creative energy – and the fact that my children live here. What do you miss most about Cambridge? The trees and the Charles River. Favorite place for a drink? My living room sofa. Wally makes excellent cocktails. Favorite place to get peace of mind and write? I write in a comfortable chair in my bedroom, which is up in the trees. I could sit there for hours. Unfortunately, now they say that sitting for hours in a comfortable chair is not healthy. Hurry! Time is running out!